Kevin is a fifth-grader who actually enjoys taking science tests because he knows the perfect way to become well prepared. Even difficult science concepts can be easy to grasp with clear explanations and animations. Marko, a humanoid pencil, has just the right tips to help Kevin understand science, have fun, and get ready for tests. Marko introduces Kevin to Bailey, a butterfly who is an expert in Life Science. Once they arrive at Marko's Super Science Station, the fun learning begins. Kevin gets ready for his life science test with lessons on plants and photosynthesis, and he even has a chance to show off a few things his grandfather taught him about plant reproduction. There's even a surprise visit by legendary rocker "Rubbert Plant," who performs a medley of his hit songs about xylem and phloem cells. Then Bailey teaches Kevin about her favorite topic: the life cycle of a butterfly. Just as she is finishing the lesson, Bailey challenges Kevin to be a contestant on a game show about animal groups and characteristics. After winning the game show to the crowd's delight, Marko shrinks everyone down to visit the Cellular Learning Center. Kevin gets the inside scoop on plant and animal cells, and learns how they are similar and different. Then Marko gives Kevin (and everyone) a special treat by revealing the location of his "Edible Cell Model" recipes on his website. Our adventurers then size things up to reach the Ecosystem Learning Center. Kevin learns all about food chains and food webs, and he comes to understand how organisms depend on each other to keep ecosystems in balance. Marko and Bailey also give lessons about genetic traits and adaptations. After the main portion of the DVD, students can go back whenever they want to review any section. The DVD menu makes this easy. Finally, when students are ready, they can join Kevin, Marko, and Bailey to take a practice Life Science test in the Bonus Section of this DVD. Marko and Bailey coach Kevin on how to remember what he has learned and apply his knowledge to scoring high on life science tests. It's a great review for all that's been learned. Marko even shares his secret website where students can download free study materials to complement this DVD. 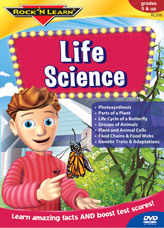 Life Science DVD is useful for parents or grandparents to purchase for kids who love science and want to learn more. It's fun for any age, even kids much younger than fifth grade wanting to get an advanced understanding of science concepts. It's also perfect for parents looking to help their students get prepared for standardized science tests, around the fifth grade level and beyond. Good test preparation helps ease anxiety. 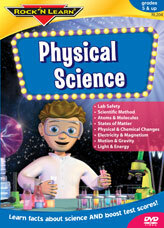 Along with our other DVDs, Physical Science and Earth Science, students will have a complete and highly entertaining approach to science test preparation. Teachers love these DVDs for classroom use. They may use certain segments to help explain or introduce concepts that students have trouble grasping. These programs can be an important part of boosting science knowledge and preparing for state-mandated standardized science tests in any state. Marko the Pencil is played by actor Vic Mignogna, Best Actor 2007 American Anime Awards and the voice for many popular video games. Get started immediately by helping your child or your students brush up on earth science knowledge and learn some really great test-taking skills.